Comments: Standard US PB edition. . . . Ships no later than 24 hrs from receipt of your order. For Hawaii customers - Standard shipping will take 30 days to get to Hawaii. We ship according to customer's stated preference. Customers are encouraged to check their emails once they complete an order to us. We monitor our emails from customers continuously. 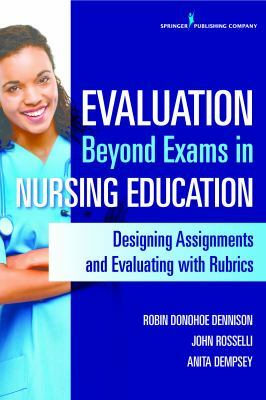 Dennison, Robin is the author of 'Evaluation Beyond Exams in Nursing Education : Designing Assignments and Evaluating with Rubrics', published 2014 under ISBN 9780826127082 and ISBN 0826127088. Loading marketplace prices 118 copies from $50.90 How does the rental process work?